Deb's Cup of Tea: I CAN Haz Cheeseburger? This has to be one of the silliest photos of Mija ever. Saturday, after the book fair, I went through Wendy's drive-through to get that strawberry parfait they were advertising. (Here's the link to my impression of that.) Well, it's lunchtime and I might as well get something to eat. I eat low on the cost list at Wendy's. I'm very happy with a junior bacon cheeseburger, fries and a drink. When I got home, of course she HAD to see what I had. If I'm eating it, she needs to know what it is, nevermind that I tell her she won't like it. I let her smell it. She does like turkey deli meat and hard cheese. Deli sandwiches have to be eaten standing up or she's in my face about sharing. Pilchard, on the other hand, couldn't care less. She wants to see what I have but generally turns up her nose at it. They both like a bit of tuna water but not all that's in a can. They aren't really people food eaters, which is good. They don't NEED people food to survive. Mija was unimpressed by the bacon cheeseburger. It may look like she's salivating but she's really just licking off her nose from the scent. She got down after this and I ate my cheeseburger in peace. 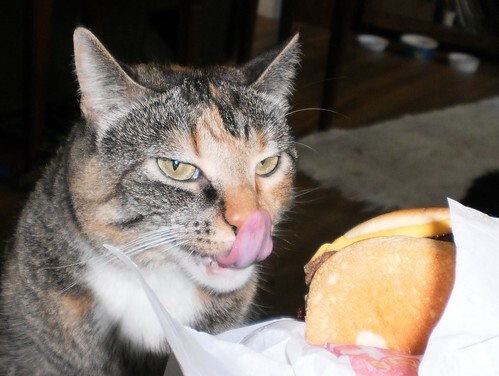 I should post this to the I Can Haz Cheeseburger web site with the following caption, "For me? This thing better not have catsup on it."